I had family members make a last-minute visit to Baltimore last weekend. I always love their company, but after a few mouse clicks, I quickly realized their timing couldn't have been worse (for reasons I will explain below). It seemed like there were no affordable hotels in the entire city. I am usually apprehensive to attempt booking rooms in the Inner Harbor during a summer weekend. The massive amount of tourists drive the hotel prices to rather unreasonable heights. When I was done with my preliminary scan, my worst fears were confirmed. The major hotel chains were all in the $270 and up price range. For a three night stay, this just wouldn't do. I have a special corporate code at the Hilton Baltimore Convention Center (one of my family's favorite hotels). This is our default spot due to my Hilton Gold Elite Status. My family gets free breakfast and an upgraded room, so it's hard to beat. Unfortunately, all the rooms under the code were sold out! Quickly scrambling, I was able to secure a pre-paid rate at the Marriott Residence Inn Baltimore Inner Harbor for about $150/night. Normally I detest prepaid rates: they are usually only within a few dollars of the fully-cancellable rate, and I enjoy the flexibility if ever needed. However, with my family's non-refundable flight already confirmed and the possibility of getting one step closer to Marriott Silver Elite status, this was a no-brainer. The hotel is located on the usually bustling Light Street. However, due to a water main break last month, the street was barricaded and nearly deserted. This lent an almost eerie feel to exterior, but it wasn't anything to worry about. Once inside, check-in went smoothly. We were only given a room on the 4th floor. This is usually a point where you have to speak up and ask if there is an upgrade or anything on a higher floor available. However, with traffic shut-down due to the water mane issue, it was a moot point. All was very quiet each night. The room itself was very large, especially for the solid rate we got. Normally business hotel rooms in the heart of the Inner Harbor are a bit cramped for my tastes. However, this room featured a kitchen, separate living room with work station, and large bedroom/bathroom. The kitchen was handy, and the refrigerator was absolutely massive. The workstation area was key, too. At Residence Inns, internet is always complimentary. While my family members showered and prepped for our touristy activities, I was able to get some work done. The connection speed was very fast, so I had no complaints. The sleeping area had two good nightstands and another flat screen television. I really liked the paintings of Baltimore landmarks on the wall. Normally you see generic nature scenes, so this was a nice touch to emphasize the downtown location. Off the bedroom was the wash area and separate toilet/shower room. This is always helpful, especially when more than two people are sharing the room. We had no issues with water pressure, and the shower room was clean....a very important detail that should not be overlooked! Breakfast was served in the downstairs lounge each morning and was complimentary to all guests. I was not able to partake, but my family members said that the spread was decent with fruit, cereals, eggs, and sausage. One family member described the sausage as "iffy," so word of warning if you are banking on filling up on breakfast during your trip to Baltimore. Overall, this was the perfect choice for my family's long weekend visit. They had plenty of space to spread out and unwind. Free breakfast helped save everyone money, and the rooms were clean and comfortable. There isn't much more you can ask for $150/night on a busy summer weekend in Baltimore. If the water mane break had been fixed, I doubt we would have secured such a great rate. 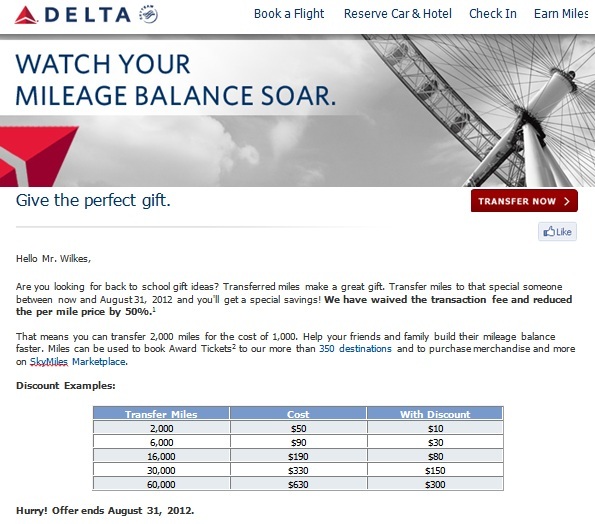 Through August 31st, Delta Airlines is discounting all Skymiles transfers between accounts. 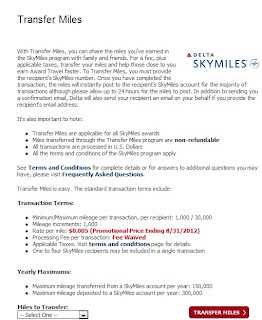 Skymiles normally cost about one cent per mile to transfer, and that is excluding the $30 "transfer fee." With this promotion, you are paying about half a penny ($0.005) per mile and the fee is also waived. I know that I have hammered Skymiles in a previous post, but there is a lot of earning/redeeming potential with them. Skymiles are one of the easiest points currencies to acquire, especially with lucrative credit card sign up bonuses. In fact, Ms. CCT just received a targeted offer in the mail for a whopping 50,000 Skymiles if she signed up for the Delta American Express Gold card. If you are near an award goal (perhaps just shy of 25,000 or 50,000 Skymiles), then taking part in this promotion makes sense, especially if family members can combine their Skymiles into one one account to make award travel possible. 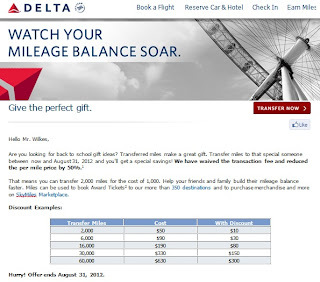 However, Delta has run even better promotions in the past. 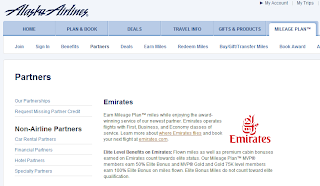 Late last year, they offered a great 100% bonus on any transferred or purchased miles. I would advocate jumping on that, but this seems a bit ho-hum. Still if consolidating miles into one account is feasible, this transfer might make sense. Keep in mind that their online award booking site is often an exercise in frustration. Finding award tickets at the "low" level can oftentimes be nearly impossible. However, there are workarounds and some good tricks to employ (details coming in a future post). Drop me an email if you are looking to book a Skymiles award ticket. I can help. Three articles came across my feed today that I found pretty interesting. I found this to be a quick but enjoyable read that touched on some of the things that we constantly discuss when traveling yet never really answer. I know you might get funny looks applying sunscreen on a plane, but at least the article addresses a valid concern of some travelers. Sadly, the age old question about cell phones being turned off isn't really answered at all. The issue is left open for interpretation and the "better safe than sorry" mentality. The New York Times also published an article on travelers' age-old battle with jet lag. Obviously with the advent of commercial travel, we have only been crossing time zones for roughly 100 years. Our bodies haven't yet evolved and adapted to the stresses that jet lag causes. The author references some great (avoid alcohol) and also off the wall (wear sunglasses the entire flight) methods to beating the jet lag monster. Some of these tips come from the NASA "fatigue management team." Who knew they even existed?? The third article is much more playful and even a bit philosophical in nature. Appearing on CNN Travel, this feature talks about the different types of personalities that tend to opt for either aisle or window seats. Aisle seat occupants are more focused on work and relish the ability to leave the seat quickly if need be. Window seat enthusiasts tend to be more romantic and artistic (take this for what it's worth). They love that million-dollar view that is exclusively theirs. My issue is that in the beginning of my flying "career," I was a die-hard window seat supporter. These days? I tend to mix it up and try out the aisle on longer hauls. What does this mean? Am I having an existential crisis? Let me know what you think. Drop a comment and let me know which type of person you are: aisle or window. Until tomorrow everyone! CNN Travel: Are You a Window Flier or Aisle Seater? I wrote an article rather recently praising the value of flexible miles (such as American and Delta) while criticizing the fixed value of Capital One miles. This post is the counter argument. Capital One miles have a fixed value, and can be redeemed at one cent per mile on any ticket available for purchase. 40,000 Capital One miles can be redeemed for $400 off any flight, and for many, this easy conversion system makes life a lot simpler when firming up travel plans. The legacy carriers, such as Delta Airlines, allow miles to stretch quite a bit further than their Capital One counterparts. 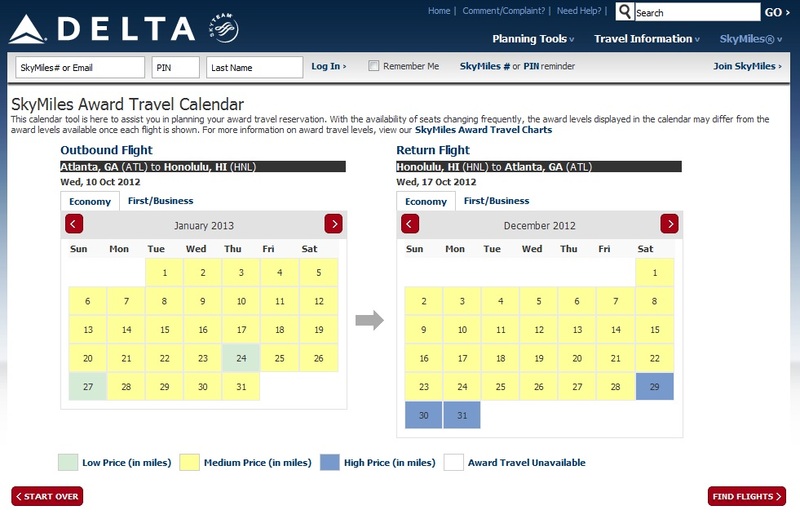 Delta, for instance, publishes an award chart with "Low" "Medium" and "High" award tickets. 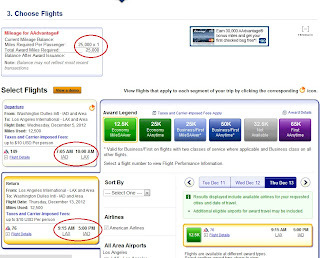 A "low" award ticket for domestic round trip travel is 25,000 miles, "medium" is 40,000 miles, and "high" is 60,000 miles. Delta markets this award chart as user friendly. Travelers never have to worry about award seats not being available! They are always bookable with miles....not always at the price you want to pay, though. 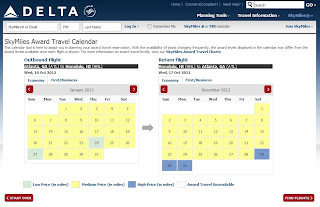 Let me explain three reasons why booking Delta awards isn't always a bed of roses. I decided to take a look at travel from Atlanta to Honolulu in November or December. Ms. CCT and I traveled this route last year, but we paid cash because the fare was so low. The award chart, unfortunately, was a grizzly mess when I checked. There were very few green (low) dates. Nearly every day was at "medium" or "high." After saving for a long time, you can imagine how defeating it is to see that the trip you envisioned will cost nearly double what it would with another airline. Where Have All The Reasonable Awards Gone? Delta is very proactive in making sure highly in-demand award tickets are only bookable at the "medium" or "high" level. Tropical destinations in the winter and Europe in the summer are just two prime times for Delta to adjust the price in miles to their favor. Be forewarned. If you want to try to steal a "low" award during these times, you need to be active very early. Plan to book around one year before your actual travel dates. This problem comes from first hand experience and it really highlights the IT issues that Delta.com has. A "low" coach ticket award from the U.S. to Europe costs 60,000 Skymiles. This is very reasonable and in line with what the other carriers are charging. Because I have family in Madrid, I thought to take a look at the Atlanta-Madrid route in November. See below. There are many green (low) dates on the calendar, so on the surface it looks like I shouldn't have any trouble finding a "low" 60,000 mile award. In the picture above, I highlighted two green dates and clicked to book. Unfortunately, a nasty surprise awaited me. Sure enough, the least expensive award available was 75,000 miles. I have no idea how their system is computing things, but you can imagine how irritating this can be. If you play around with the calendar long enough, you can see that the Delta Award calendar is truly a broken mess. 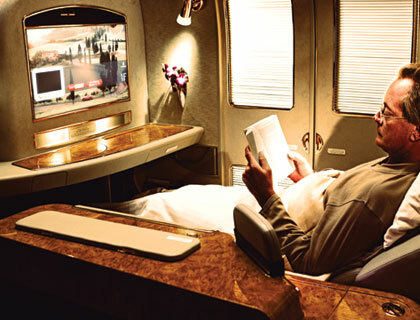 Some people have reported seeing business class tickets to Asia for over 550,000 Skymiles a person! Even a "high" award is 350,000 Skymiles, so where are they getting these insane numbers from? 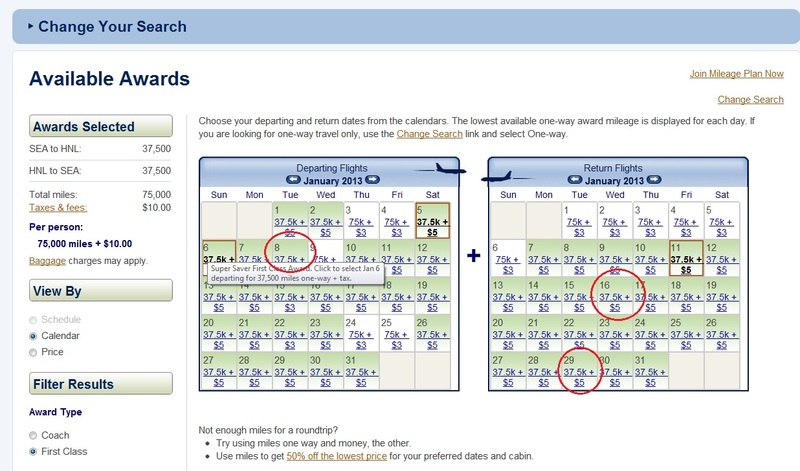 For me, these little glitches are the reason people get so turned off in booking award travel. 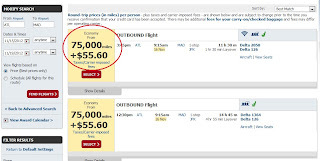 Like U.S. Airways, Delta charges the same number of miles for a one-way as a round trip award ticket. This greatly limits the flexibility of Skymiles, especially when you are faced with a rather expensive award booking. I've given you some reasons to avoid Delta Skymiles, but there are some really good values if you plan ahead and are flexible. For instance, Delta has incredible coverage of Europe from JFK and Atlanta. You can get to places such as Budapest, Barcelona, Copenhagen, and Prague relatively easily. They also have some interesting airline partners, such as Air France. 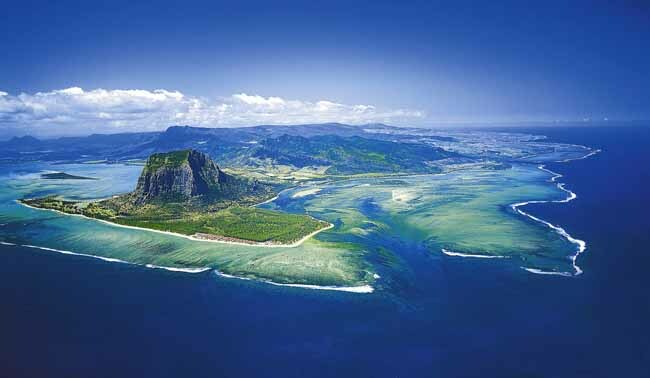 With Skymiles, you can visit exotic destinations such as Mauritius by routing an award ticket through Paris on Air France. No other North American carrier will get you therein such an easy manner! Don't fret because in future posts I will show you some ways to harness the Delta Award Calendar. There really are some good deals to be had with Skymiles. Don't lose hope! 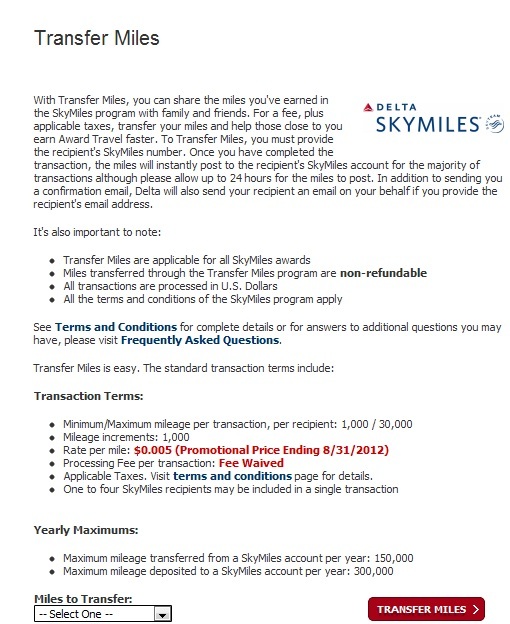 If you are planning on booking a Delta award ticket or have some Skymiles lying around, don't hesitate to email me. I can help. Until tomorrow! The Ultimate Dream Plane: Bars, Showers, and Suites! I came across a pretty inspiring video this afternoon, and the timing could not have been more perfect. Check out the video below. It is of an Emirates A380 flight from Bangkok to Hong Kong. The gentleman taping the video had the pleasure of sitting in "Suites Class," which is the name of their ultra-premium First Class on the A380 aircraft. The only North American A380 routes that Emirates currently serves are from New York-Dubai and Toronto-Dubai. I highly encourage you to check out the features of the plane in both the video and through Emirates web site directly. On-board showers, gourmet meals, privates sleeper suites, and an actual cocktail bar are just some of the many amenities of this jumbo jet. Minutes 3:53-6:00 are where the true highlights happen, including meal service and a tour of all three cabins (Suites, Business, and Economy). Now let's get down to business. How in the world can you possibly get a seat on one of these exclusive flights?? Interesting you should ask. Emirates used to be allied with Continental, but that partnership ended in March of 2011. United's partnership with them was also discontinued. Luckily, Alaska Airlines announced that they would be partners with Emirates in January of this year. The best part? 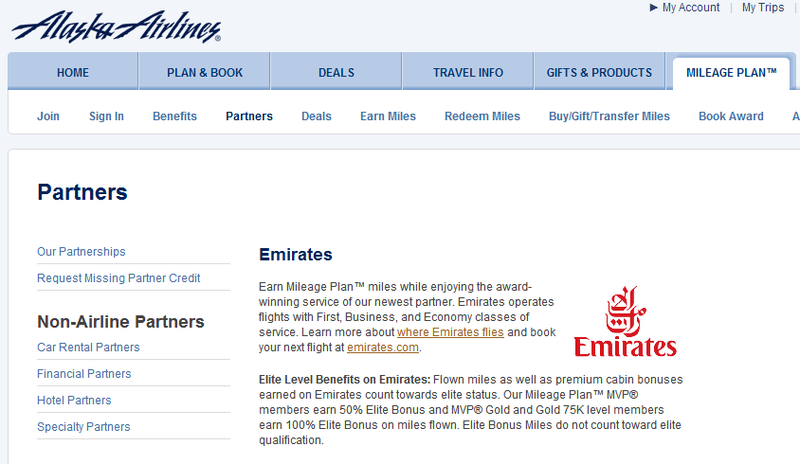 You can redeem miles for award flights beginning in "late 2012"! Though redemptions for "Suites Class" aren't a guarantee, the possibility is at least in play. This means that you need to start stockpiling some Alaska Airlines miles quickly. There are plenty of ways to do this via flights, transferring of hotel points, credit card sign ups, and a few other tricks. I will definitely discuss good earning strategies in a future post. After all, aren't you dying to fly like the gentleman in the picture below? I know I am! We can all do it and not have to empty our savings accounts. Let's make this a bucket list goal that is actually attainable. Until tomorrow! Our next trip has been penciled in for November, and we will be heading to Clemson, South Carolina to catch the Clemson vs. N.C. State football game! When I heard that this would be our next mini-vacation, I was pretty excited. Going to a small school for college had its benefits, but successful sports teams was certainly not one of them. A great blog entry from the New York Times hinted at the fact that people derive more happiness from planning their vacations than actually experiencing them. I think there is some truth to that. After all, while on the vacation, things can go wrong. All the work piling up on your desk can certainly be a distraction in the back of your head, as well. Unfortunately, I didn't derive a single ounce of happiness from looking at Clemson hotel rates on a home football game weekend. Look at those prices for the Marriott Courtyard Clemson 4 miles from campus! You could say that I'm a bit concerned about getting gouged here. I realize that this is the nature of big-time college athletics, but we need to stay close to campus for a host of reasons. The flights and rental car should be relatively inexpensive. I just need to figure out a good hotel strategy. Thoughts? Let me know if you come up with something. I will share my rough itinerary once it has all been confirmed, along with my methodology for booking the individual parts. News recently broke that the Intercontinental Hotel chain would be raising the price of their Ambassador Elite Status from $150 to $200 per year. This bears discussion, as Intercontinental is the rare hotel chain that allows you to purchase elite status directly without having stayed at a single property. Ambassador status comes with a host of benefits, including a one-level room upgrade, 4:00 p.m. late check out, complimentary mineral water and fresh fruit upon arrival, and one free PPV movie per stay. I actually purchased Ambassador status back in March. Do I plan on staying at a bunch of Intercontinentals this year? Absolutely not! I took the plunge for two reasons. The first is that Ms. CCT & I will be staying at the Intercontinental Bali during a trip later this year. I used points to book the trip, but also emailed the hotel and asked for an upgrade to an even better room. We negotiated a fair price, and I am hedging that my Ambassador status will give us ANOTHER upgrade, essentially a two room category bump. Is it risky? Of course, but the other benefits should make the trip enjoyable, so I won't freak out if we don't get the double dip room upgrade. A second reason for the Ambassador status purchase is the complimentary weekend night certificate you receive upon enrollment and renewal. Don't go crazy and assume this means you can just book a night at the ultra-luxurious properties and expect it to be free. There is always a catch: you must purchase a second weekend night along with the certificate. Essentially, this is a "buy one, get one free" offer. We have heard great things about both the Intercontinental Times Square and Intercontinental Barclay, and we love visiting New York City at Christmas time. 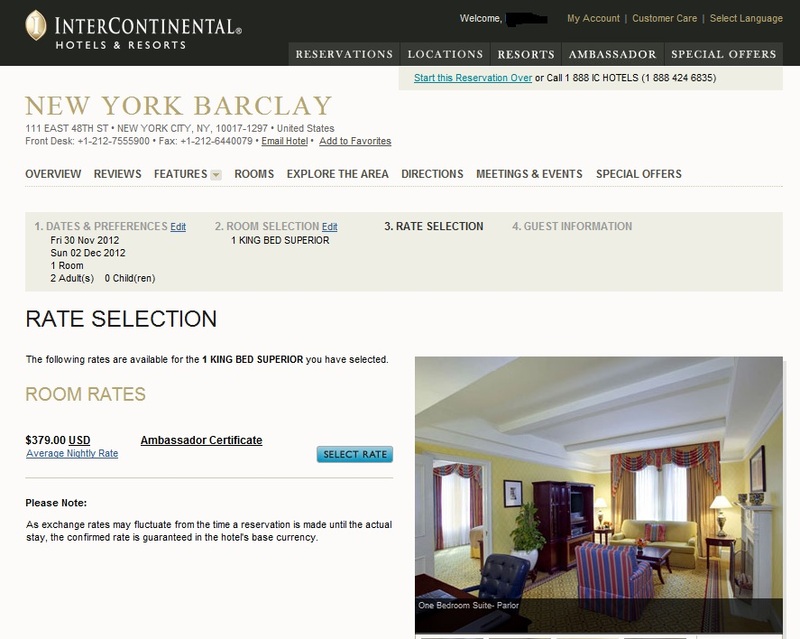 This BOGO certificate should ease the sting out of the normally exorbitant New York hotel prices. As you can see from the picture above, we found the IC Times Square sister property, the IC Barclay, at a "reasonable" $379/night on an early December weekend. By applying the certificate to the reservation, our average per night comes to a more affordable $190/night, which is great by New York standards. We can even think of it as "saving" $190, which offsets the annual fee. With two big trips on the forecast (Bali and New York City), we thought Ambassador status was more than worth the $150 annual fee. Next year, though, you can bet that we will reevaluate its value. Finding $200 worth of "value" out of Ambassador status will be very difficult in 2013, as my travels rarely take me to their properties. What do you guys think? Any feelings on the cost vs. benefits or the annual fee increase? Let me know if you have any questions. A common complaint that often appears in my inbox comes from travel enthusiasts frustrated by the award ticket process. These people have lots of trouble finding award seats on Delta, United, and American with their hard-earned miles. They want to throw their hands up and just get a Capital One credit card. They have heard great things about Capital One's "no hassle" miles policy and ease of use. I'm telling them to think twice before jumping ship. Capital One has done very well for themselves with their Venture Rewards credit card and aggressive marketing promotion. They position themselves as the "easiest" miles to use without having to tediously search online for seats that may or may not be available. 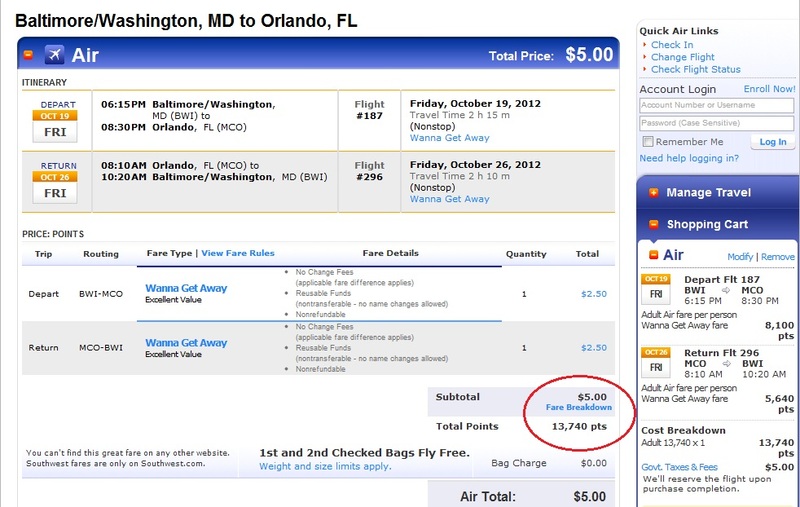 If airlines advertise a seat for sale online, you can use your Venture Rewards miles to book it: no questions asked. Check out their landing page if you don't believe me. Those Miles Look Easy to Use, But Are They Worth Anything? The problem with Capital One miles is they have a fixed value. 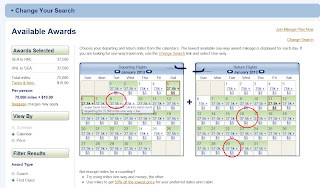 When redeeming for flights, you are redeeming at a penny per mile, no exceptions. If you have accumulated 25,000 miles towards award travel, Capital One allows you to discount any available flight up to $250. Capital One miles have a fixed value of one cent per mile. That's it, no budging. If you don't see the problem with that equation, let me explain further. 25,000 American Airlines miles will get you a domestic round trip ticket, no matter the cost. Sure, there are dates or non-stop options that might not be available, but you are trading some ease of use for so much more value. Those 25,000 American miles might get you a transcontinental ticket that would normally cost $500 or more! 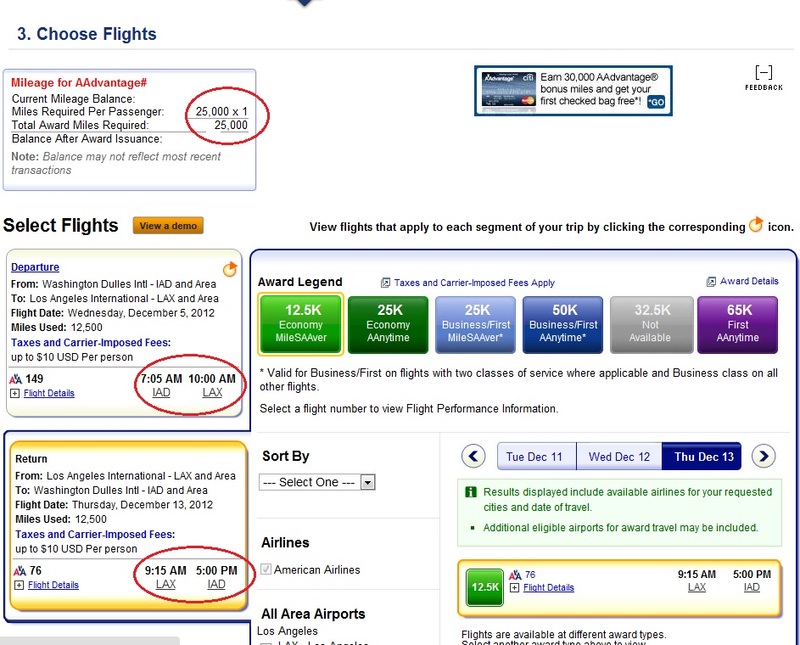 Expensive to fly from D.C. to L.A. non-stop! As an example, I plugged in random dates in December from Washington D.C. to Los Angeles. Non-stop flights on American were sky-high, but I was still able to find an award seat for 25,000 miles. The flight normally cost about $550, but I was easily able to find an award ticket at the standard level. My American Airlines Miles had a redemptive value of 2.2 cents per mile, over double the value of Capital One miles! Sadly, the 25,000 Capital One Venture Rewards miles I had would only reduce the cost of this flight by $250. I would still have to pay $304 out of pocket. That hardly seems like a free flight, does it? I'm not trying to dump on Capital One, but I want travelers to be very aware of what they are getting into when aligning themselves with Capital One. They certainly won't have to worry about searching an award calendar to find a good itinerary, but their miles won't take them nearly as far if they had gone with a flexible value system such as American Airlines. 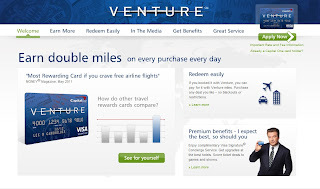 I will gladly tradethe ease of use Venture miles touts for the overwhelmingly better value of American Airlines miles. If this post has been confusing, please don't hesitate to drop me an email or leave a comment. I have really appreciated all of your emails, so please keep them coming. One might be featured on the next mailbag! Until tomorrow, everyone! 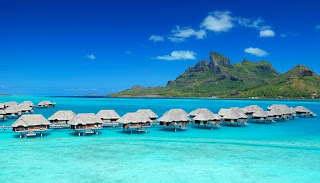 An interesting article came through my news feed today regarding the truly aspirational destination of Bora Bora. Air Tahiti Nui, which codeshares with American Airlines (and also has reciprocal ties to Delta Airlines) will be selling discounted tickets to Papeete, Tahiti from various major U.S. cities. The rates being publicized under the "18 Cities, One Price" promotion start around $1,400. Through the press release, these $1,400 rates from cities like Boston and New York to Tahiti are set at the same rate as the Los Angeles-Tahiti route, saving passengers over $600 per ticket. 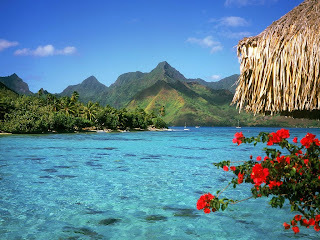 Bora Bora (via Papeete) remains one the premier destinations on the globe and also one of the hardest award tickets to find. The only ways to redeem miles from the United States are through Air France and Air Tahiti Nui, and award tickets are scarce at best, especially in business class (First Class service isn't even bookable with miles). With a sale like this, it might be best to save the miles for another occasion and book directly. The best news of the press release is the free stopover in either Los Angeles or Papeete (if traveling onto one of the smaller islands) that can be built into your itinerary. You can really add a lot of value and extend your vacation through a stopover in either city. Sales to exotic locales like Tahiti happen rarely, so if you are looking for a great vacation, this might be the time to pounce. Safe travels, everyone! Until tomorrow. I will certainly be hammering this point home in upcoming posts but it bears repeating. The best way to turbocharge your points/miles balance is through credit card sign-up bonuses. Credit card companies such as Chase, American Express, Citi, and Bank of America are practically tripping over themselves to get qualified applicants, and they are doing so through lucrative miles and points incentives. Chase's Southwest Airlines Rapid Rewards Visa (and its sign-up bonus) is a perfect example of a credit card company trying to engender loyal and reliable spending. The card is also a great way for families to quickly boost their travel budget and open up tons of flexible options and appealing destinations. Currently, Chase is offering a sign-up bonus of 50,000 Rapid Rewards points (hereto referred to as RR Points) for spending $1,000 in the first three months of card membership. The card also offers 1 RR Point for every $1 spent and 2 RR Points for every $1 spent on Southwest Airlines purchases. The card also has a $69 annual fee that is not waived for the first year. $1,000 in three months is a very attainable spending threshold, and it opens up quite a few travel options. If you plan ahead enough, you can turn 50,000 RR points into over $830 in free travel! As you can see from the award chart above, your RR points redemptive value depends on which of the three fare classes you book (Business Select, Anytime, or Wanna Get Away). 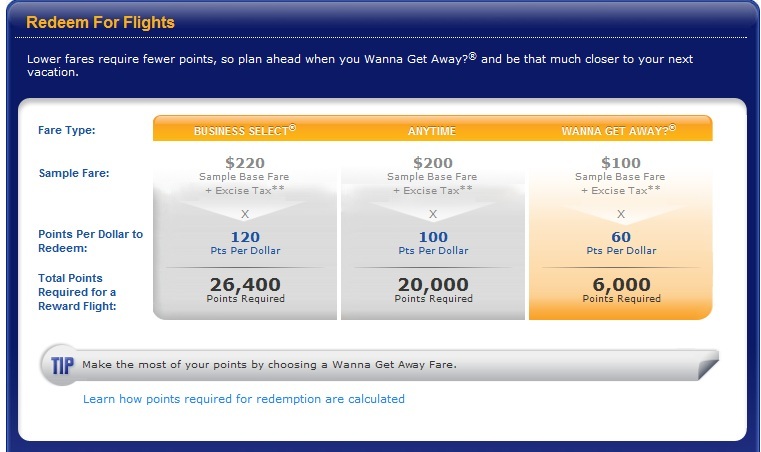 Focus exclusively on redeeming your points on Wanna Get Away fares. 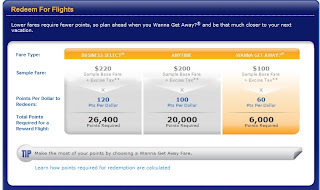 Every $100 in travel will only "cost" 6,000 Rapids Rewards Points when booking "Wanna Get Away" fares. This is a vastly better proposition than redeeming in the other fare classes. $100 in "Anytime fares" will cost 10,000 RR Points and $100 in "Business Select" fares will cost a whopping 12,000 RR points! By doing your research and booking your vacation far enough out, there will be plenty of low "Wanna Get Away" fares available. You will easily be able to stretch your points incredibly far. 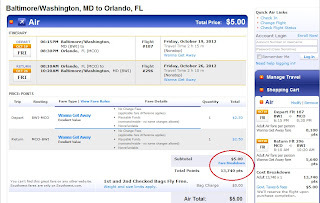 To show you a great example, I priced out a sample trip from Baltimore to Orlando in October. I chose Orlando due to the many family-friendly attractions in the area. 13,740 RR Points and $5.00 for a Round Trip Ticket? Yes Please! This is just one itinerary, but I found several Baltimore-Orlando round-trip tickets that priced out at 13,740 RR Points and $5.00 in government taxes. That's incredible! A family of four would only need 55,000 RR Points to get to Orlando and back. With the Chase Southwest Visa, you are more than 90% of the way there. I highly advocate that any family planning a big domestic trip check out the Chase Southwest Rapid Rewards Visa. Having more than $800 in flight credit to play with can be a powerful tool, all for a simple credit card application. The fact that checked bags are free as well means the savings are even greater with Southwest. This isn't a card for travelers and families taking exotic vacations to Koh Samui or the Greek Isles, but it's certainly worthy of your wallet if you're looking to take the entire family to Orlando/Miami or one of the many other cities that Southwest serves such as San Francisco or Denver. Two other notes before I go. There are two version of this card, the Plus and the Premier, that are offering identical sign-up bonuses. The Premier card has a steeper $99 annual fee, so steer clear and go with the Plus card. Second, there is no reason that BOTH spouses can't sign up for this card. Pooling together a whopping 100,000 RR points will guarantee multiple vacations for minimal effort! Let me know if you have any questions about Southwest Rapid Rewards or this article. Leave a comment or send me an email. I have really appreciated all the emails, so far. Keep them coming. Until tomrrow! Finding a relaxing, casual restaurant can be tricky, especially in the Federal Hill neighborhood of Baltimore. Known for its (late) night life scene, Federal Hill attracts a very young crowd and the food/bar scene reflects that. Luckily, the area does have a few low-key cafes and bars that offer more than blaring techno music and $5 Bud Light bottles. Metropolitan Coffee House is just one of those inviting places that makes it the quintessential neighborhood hangout. With some family in town last week, we decided to have a quick meal at Metropolitan since most of the other restaurants near my house serve generic pub food or sometimes-polarizing ethnic cuisine. It turned out to be just what we needed. Located at the edge of the Otterbein neighborhood on busy Charles Street, Metropolitan has a very bold exterior and an old, dark interior. If you are looking for an intimate place to have a few craft beers with close friends, it's the place to go. We settled at our table near the front and were immediately greeted with a very imposing menu. Check out all the choices, and that's just the appetizer menu! One of the adages of the restaurant industry is that you should specialize: do a few menu items very well, but don't extend yourself. Metropolitan's menu may seem weighty, but they certainly didn't mail anything in. Everything we had was pretty good. The appetizer menu was a page unto itself, but the seafood lovers at the table quickly settled on the Tuna Carpaccio. The dish came out warm, which was surprising for an item usually served cold or at the very least chilled. Nevertheless, we loved the large chunks of avocado and fresh tomato salsa coupled with thinly sliced raw tuna....the perfect appetizer! Once we polished off the tuna, it was time to tackle the nearly six page entrees menu. After some "intense" back and forth discussions with my table, Ms. CCT opted for the Trivia Salad. We have both had good experiences with the dinner salads here before, so it was a natural choice for her. She enjoyed how light it was yet it was still filling enough to be considered a meal. In checking out the rest of the salads offered at Metropolitan, you could probably say the same thing. Rachel's Tuna Salad (not pictured) is another solid choice from that menu. I settled on the intriguing sesame-encrusted salmon, while the other person opted for grilled mahi-mahi with mango salsa. The mahi-mahi was expertly done, and the delicately prepared salsa made it a great summer dish. My sesame salmon was much more average. The cut of fish was great, don't get me wrong, but the salmon was infused with a bit too much soy sauce. Once you bit past the layer of crunchy sesame seeds (great texture juxtaposition), you were greeted with quite a bit of soy sauce. If they toned that down a bit more, it would have been a hit. Minor squabbles aside, Metropolitan is one of my favorite spots in Federal Hill. The food isn't spectacular, but the menu is enormous and everything is usually done well. All of that aside, it's certainly a great place to have dinner/drinks with friends. The wine selection is lenghthy and affordable. The craft beers, though, separate it from most other bars in the neighborhood. With a constant rotation and variety of choices, the beer connoisseur will have an absolute field day at Metropolitan. Metropolitan is a relaxed institution in the Federal Hill neighborhood. I'm glad it will be around for a long time It's a nice escape from the usual hard-partying scene that Federal Hill attracts. What are your thoughts? Drop me an email if you've been to Metropolitan before. Until tomorrow everyone. Stay hungry! I'm not the most technically proficient person out there, but I'll take victories whenever I can get them. No need to type in the rather wordy address for this site anymore. You can simply enter "charmcitytraveler.com" and your browser should automatically redirect to the blog. If you prefer to receive blog posts via email, simply subscribe using the tool at the top right corner of the blog. Submit your email in the "Follow by Email" box and you are all set. I have tested it out and it works just fine. Also remember to follow me on Twitter. My handle is @charmcityblog. I will tweet out articles as well as talk about some minor but interesting things going on in the world of travel. I promise to avoid saturating your feed with updates like "just ate a sandwich" or "beautiful weather today!" We could all do without that sort of stuff. If you think there are some features that this site is greatly lacking, shoot me an email or drop me a comment. I might not be able to immediately remedy your concerns, but at least I will ask one of my more tech-savvy friends the answer. Until tomorrow everyone. Safe and happy travels! The W Hotel Store is holding a 35% off sale on beds and linens (ending August 27th). We have been in the market for a W bed or a Westin Heavenly mattress for quite sometime, so this sale comes at the perfect time. 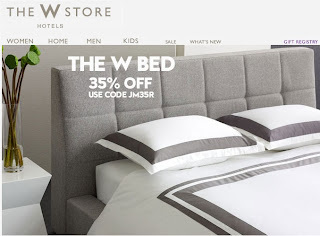 By using promo code "JM35R" at checkout, you will receive 35% off any W mattress or bedding. If you haven't spent a night on a W bed, you truly are missing out. It's one of the most comfortable night sleeps I've ever had, and that's no exaggeration. The 35% off code brings down the mattresses to relatively reasonable rates. I certainly wouldn't pay full retail for these beds, as these sales seem to pop up once or twice a year. If you are in the market for a bed like we are, I would definitely investigate this. Until tomorrow. Pleasant dreams, everyone! Giant tip of the cap to Online Travel Review for figuring this one out! I promise this blog isn't dedicated to awesome travel deals to Hawaii, even though it seems that way lately. 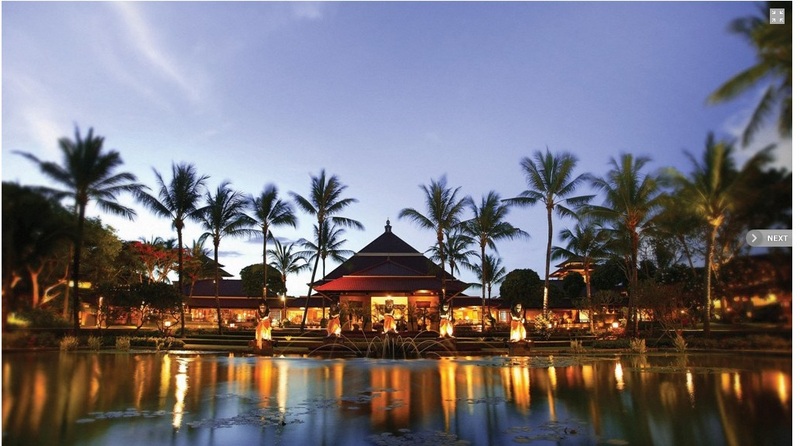 This travel gem is more complicated than my previous post about U.S. Airways flights to Hawaii for $569, but it's well worth your time and effort. Icelandair, based in (obviously) Iceland, is having a sale on points in their loyalty program, Saga Club. Through September 28th, purchases of Saga Club miles earn a 20% bonus. Purchasing 25,000 Saga Club miles will net you an additional 5,000 miles with the bonus promotion, and the total cost will be 39,500 Icelandic Krona. That sounds like a lot, doesn't it? If you go to any currency conversion website, you will see that 39,500 Icelandic Krona is only $330. This deal is so great because the points purchased are being bought in Krona. Thus you are leveraging the strength of the U.S. dollar against Icelandic currency. Now, down to business. 30,000 Saga Club miles will get you a round-trip first class ticket on Alaska Airlines. Check out the award chart here if you don't believe me. There are some things to note with this deal, but if you are really wondering if this is just a hoax, I assure you it isn't! Due to the overwhelming demand, it will take some time to fully register for the Icelandair Saga Club. This is the first and most important step, but due to crazy deal, Icelandair is having a tough time automatically registering everyone who signs up for the Saga Club. I believe they are trying their hardest and will get everyone registered as quickly as possible. My account is still in limbo at the time of writing. Availability is a bit tricky to search for. You must call Icelandair directly to book after searching on Alaska's website. 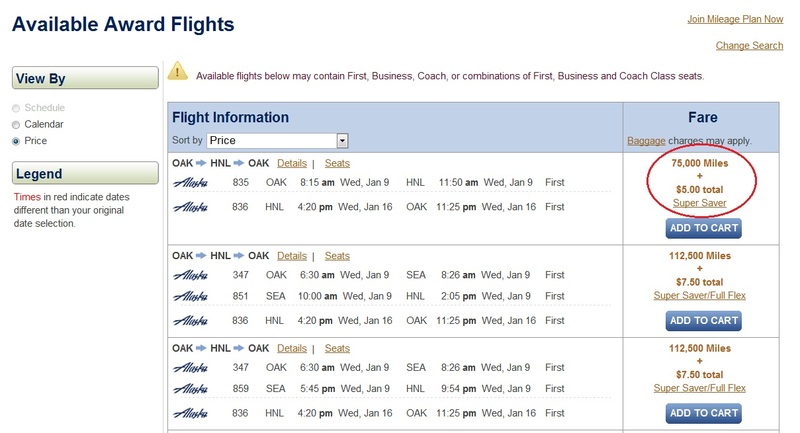 Finding coach and first class seats can be tough, especially with Alaska restricting Icelandair's access to their award inventory. Using a tool such as Expertflyer will help immensely, but that website isn't for everyone. You need to log onto Alaska's website and search for "saver" availability. Check out the screen shot below. I did a hypothetical booking for Seattle to Honolulu in January. All green dates show "saver" availability in First Class, but that might not be entirely accurate. You need to fully click through the dates to get to the itineraries screen to verify. Once you have a tentative itinerary, write it down and call Icelandair directly. Their reservations number is 1-800-223-5500. Availability is poor from the East Coast. Start from the West Coast, instead. 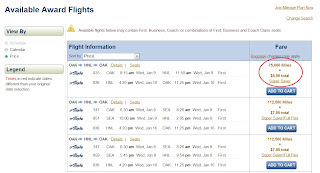 You are far better off finding an award ticket from Seattle, Portland, or Oakland to Hawaii on Alaska and buying a cheap fare to get to the origin city. The most important step is snagging that award ticket on Alaska. You can figure out how to get to gateway city on your own (via Delta, Southwest, American, or whichever carrier is least expensive). If you have any questions, don't hesitate to email me. I have posted an FAQ from the original deal finder, Online Travel Review, and their expert advice on all of this. Pay attention the caveats that they give, so that you fully understand the parameters of this deal.